This is the first in a series analyzing Richard Hofstadter’s The Idea of a Party System. During a period when progressives’ frustration with the Democratic Party seeks constructive resolution, it is worth looking at the historical evolution of parties under the leadership of the Founders, whose very fears about political parties quickly became reality. For more regular posts, please visit livingthedream.org. Jonathan Swift once wrote, “Party is the madness of many, for the gain of a few.” There are certainly progressives who can relate to that, having exhausted themselves physically and financially to return Democrats the White House and Congress, only to feel deeply disappointed with the two years leading up to the catastrophic 2010 election. While moments like this lead to grumblings about the Democratic Party, in the end, most progressives return to the fold in time for the next battle. Distinguished historian Richard Hofstadter uncovers how this came to be in his fascinating 1969 book, The Idea of a Party System: The Rise of Legitimate Opposition in the United States, 1780-1840. I came across the book at Housing Works, a used book store in Manhattan. As someone who continually questions the Democratic Party, even while voting for it religiously, I thought it worthwhile to study the role the Founders sought for political parties, as well as the role they ultimately accepted for them. Hofstadter’s thesis is that the behavior of early republican leaders, particularly Jefferson’s peaceful ascension to power in 1800, demonstrated the radical notion that an opposition party could exist and eventually take power without challenging the legitimacy of the government itself. Thus, they overcame the stigma attached to dissenting factions, which had previously been considered (or, in fact were explicitly) treasonous. It is interesting to consider that Republican opposition to both Clinton and Obama eschewed this first principle of political parties, as neither ever accepted the Democratic president’s legitimacy (one could argue that some liberals felt the same way about Bush, but their sentiments were not articulated by the Democratic leadership). The Founding Fathers, Hofstadter writes, “had a keen terror of party spirit and its evil consequences, and yet, almost as soon as their national government was in operation, found it necessary to establish parties” (p.viii). Amusingly, Hofstadter concludes the preface by noting that America in 1969 was living through “a period, certainly not the first, when discontent with the workings of the American party system is at a high pitch”(p.xi). Indeed, in all my years of reading American history and political science, it is rare to find a period that does not consider itself at a high pitch of discontent with either American politics as a whole, or its party politics in particular. What were the Founders concerns about political parties? Parties “were believed only to create social conflicts that would not otherwise occur, or to aggravate dangerously those that would occur”(p.12). Sound familiar? “Factions and parties will not suffer improvements to be made. As soon as one man hints at an improvement, his rival opposes it. No sooner has one party discovered or invented any ameliorations of the condition of man, or the order of society than the opposite party belies it, misconstrues it, misrepresents it, ridicules it, insults it, and persecutes it”(John Adams, p.28). Hofstadter notes the irony that many of the strongest critics of the political parties- Hamilton, Adams, Monroe among others- were in fact its strongest partisans, each believing that the national interest could best be served by bringing everyone into the fold under his own ideas. 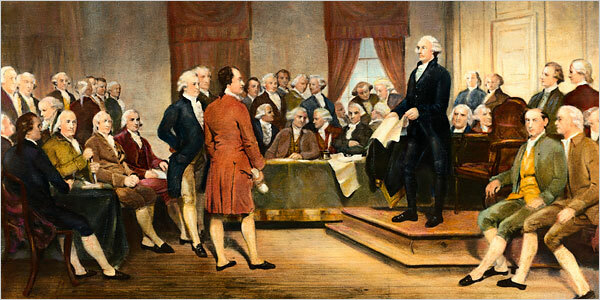 Perhaps, now 230 years on the way, we can concede that there is hardly such a thing as non-partisanship, and rarely will we have ‘consensus.’ Bright and powerful leaders will always have different ideologies, whether or not they have to manifest in Party form. Hofstadter found no Americans during this period who were explicitly in favor of parties/factions, though some, like Madison, begrudgingly accepted their likelihood, and attempted to constrict them through the constitution. In England, however, Edmund Burke argued the virtues of factions in building consensus, mutual trust, and confidence in ideas, and laid much of the intellectual ground work for the basis of permanent political parties. His basic definition of a party is “A body of men united for promoting by their joint endeavors the national interest upon some particular principle upon which they are all agreed”(p. 32). Interestingly, in calling for individuals to sacrifice their own ideologies in favor of the party, he conceded that those who could not agree with the party nine out of ten times should probably find a different party. In this “big tent” era, I doubt either Democrats or Republicans can claim many members who fit that description. “There is nothing I dread so much as the division of the republic into two great parties, each arranged under its leader, and concerting measures in opposition to each other. This, in my humble apprehension, is to be dreaded as the greatest political evil under our Constitution”(p.38). Thank you for reading. Part II will come on Friday.